I know Sheri S. Tepper primarily as a science fiction author. She tends to write sociological stuff, a little bit like Ursula K. LeGuin’s science fiction. I feel that she’s prone to having her message hijack her story, but I still read her books whenever I see a new one in the library. I wasn’t sure what to expect out of her fantasy. As it turns out, King’s Blood Four might or might not be set in a fantasy universe. There is a strong hint that it might be crypto-SF. In a way, it doesn’t matter; fantasy or science fiction, it’s still a study of an alien society. The story is narrated by Peter, a fifteen-year-old boy who lives at a boarding school devoted to teaching a peculiar chess-like game. In fact, it’s a training exercise for the deadly True Game. It seems that many people in this world have magic — or possibly psychic — powers, and the True Game forms a framework for their power struggles. It includes everything from dueling to intrigue to outright war, and children such as Peter are sent to the Schooltowns so that the True Game doesn’t chew them up as cannon fodder before they can come into their power. (We find out later that peasants — called pawns, in keeping with the chess theme — don’t ordinarily get this privilege, although at least one pawn’s mother found a way to manage it.) We also find out that Peter has been seduced by one of the teachers, a man named Mandor. The affair is forbidden, and one of the other teachers tries to warn Peter about it, but he’s convinced that he has it all under control. Everything goes to pieces at the Schooltown Festival, a time when the usual rules are suspended. Peter is drawn into the True Game, betrayed by Mandor, barely survives a sorcerous attack, and is sent away for his own protection, in the company of his friend Yarrel and the servant Chance — and that’s when he, and we, start to really learn about his world. Peter, for instance, has always been told that everyone and everything is susceptible to magic, but there are whole communities of Immutables who act as living power dampeners, turning off all “talents” in their vicinity. He receives some lessons in the perspective of the pawns, who are often used up in battles. He sees some Demesnes—one, ruled by a wizard, where there don’t seem to be any games ongoing, and another ruled by the paranoid High King, who sets mind-reading Demons to monitor his guests. And he discovers that someone is hunting him. King’s Blood Four hits a lot of classic fantasy themes. Peter has a destiny. He’s never known his parents — he was left on the school’s doorstep — but it becomes increasingly apparent that at least one of them was someone important. He comes into possession of some mysterious artifacts. And he will come into a very unusual and powerful talent, if only he can survive long enough. That being said, the story is also subversive. This is not a world where kings are just or wizards are wise. The True Game is a profoundly broken system and its most powerful players are broken people, viewing everyone around them as pieces. Perhaps the most profound part of Peter’s journey is the slow destruction of euphemisms, as he learns viscerally that “lost in play” means “killed” and “Great Game” means “war.” The hope of this world is not in killing some dark lord and putting things back the way they were. If Peter is to be any sort of hero, he has to find some way to fight the Game itself. I should point out that this is the first book of a trilogy that I haven’t finished. (The other two books are Necromancer Nine and Wizard’s Eleven.) I strongly suspect that the story will reveal itself as science fiction some time in the future, so I wouldn’t recommend it to people who like their fantasy straight. 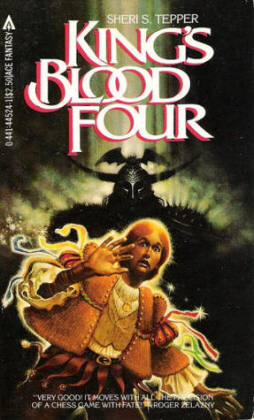 If you want a story that doesn’t lionize nobility or ignore the oppressive potential of magical power, however, King’s Blood Four is definitely worth checking out. Check out her Marianne trilogy, if you can find copies. It’s simply one of the best fantasy series that I’ve ever read–incredibly imaginative. And “Grass”, one of her early sci-fi novels, is also incredibly imaginative, one of my all-time favorites, and it doesn’t get hijacked by her message. Sadly, that became less true with later novels. I loved the novel “Family Tree”, but at one point the main character started basically preaching–reminiscent of Ayn Rand’s writing, though not as long-winded–and I remember rolling my eyes. Still a great book, however (unlike Rand).